It is very important now for musicians, artists and bands to update their fans regularly about their new release. There are many ways to accomplish this. For example, they can use Twitter, Facebook, Google+ and other social networking websites to update their fans. But it is unwise to relay completely on these mediums. It is crucial to have your own website to promote your music and band. So, when you come to websites, WordPress is giant out there. It is the best platform to setup your music website. There are many Free and Premium WordPress Music Themes that can help you a lot in promoting your music business. These WordPress Themes can be configured by custom post types, theme options panels and a lot other useful plugins. We have collected a list of such Best Responsive Music WordPress Themes that have been developed for bloggers, fun club creators, radio stations music agencies and bands. Spkies is a wordpress theme especially designed for Bands and music websites. This theme is easy to modify and ready to be up and running out of the box. With any kind of night clubs. Enhance functionality allow users to create own homepage. Its very easy to customize the look of the theme. Bolster is a wordpress theme specially designed for Bands and music websites. This template is easy to modify and ready to be up and running out of the box. Flycase is a professional and easy-to-use Music WordPress Theme. It is highly and easily customizable, ready for all devices, simple to set up and e-commerce ready. Whether you are a profesional or not, your theme includes all features you need for your band or label, to present, promote and sell your work online. Metric is the badass WordPress theme for all who love music, such as music bands, musicians, DJs, producers, labels or organizers of events and festivals. Theme has amazing modern and fresh design that will never get tired of you and your fans. Design you can freely adjust according to your fancy, there are millions of ways to do this. This very strong theme that offers perfect organization of all necessary data such as Events, Albums, Galleries and Videos. The theme also serves as a great blogging tool. Theme can be displayed on all devices from mobile phones to desktop computers (smartphones, tablets, laptops, desktops), is amazingly fluid and responsive. Just try to resize your browser window and you’ll see. Source code of theme is highly semantic and well structured, which is also very good for all search engines – SEO optimalized. This theme is awesome. We had tremendous fun making it and we hope you’ll like it as well. Aside from that the theme has a huge amount of features. We are really proud of this one as it contains our new framework which we’ll be using in all our themes from here on out. The framework unifies theme options and post options in a single visual format, making the theme a breeze to use. The StereoClub is a premium and modern WordPress Theme ideal for Music & Events, Bands, DJs, NightClubs and other music related websites. The responsive design makes it easily usable with any device (Desktop, tablet, mobile phone…), without removing any content! IronBand is the perfect WordPress theme for bands, musicians and DJs. Everything is in the details. The design is unique and comes with layered PSD. The theme includes all major features: Events & Gigs, HTML5 audio Player, YouTube Videos, News, Discography, Photos and Biography and even a Booking section. Everything’s there. “Drury Lane”, wordpress.org theme, was done especially for musicians, bands, artists and can be used by record labels as well. Specifically developed on the real needs of label owners and music producers and is the perfect tool to transform WordPress into the website for any music label or producer. 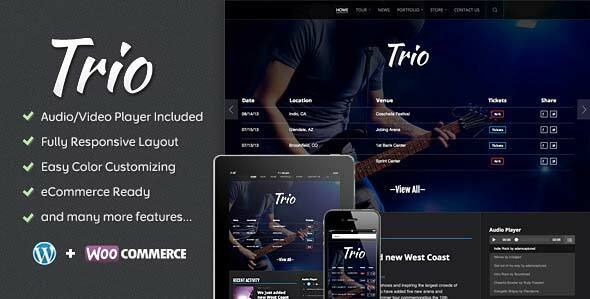 The ultimate WordPress theme for bands and musicians! Play your music. Sell your music. Sell your merchandise. List tour dates. Create a discography. And much more. The Music Theme features everything a musician needs to promote their talent. With a fully responsive design, the theme molds beautifully to mobile devices. It features an abundance of customization options — allowing for colors, textures and images to be changed with ease. Several page templates are included for multiple layout options, displaying slideshows, an album discography, tour dates and more. The Faded theme is an incredible all-in-one WordPress Theme for bands who want to have great design and tons of options. It includes a built-in HTML5 audio player widget, Facebook comments, videos, and photo albums. This theme has almost everything a band would need out-of-the-box. It also features a fully customizable image slider at the top of the page as well as a “Latest Album” showcase. Each band member can have a “latest tweets” widget including their photo and role in the band. This theme comes equipped with a well-organized Photoshop file (PSD) to help you get customizing quickly. Hernán is a responsive WordPress theme for DJs, music artists, bands, radio stations and everyone in the music business. StereoSquared is a responsive WordPress theme for DJs, music artists, bands, radio stations and everyone in the music business. the entertainment industry. This WordPress is a perfect solution while building news and music websites. The theme is to rock, share and deliver the latest information from from the music world. Isn’t it true that a sophisticated and amazingly designed WordPress website is a key to success and the Net that is the fastest way to convey a message? If so, use our latest theme with its severe and modern tiles design! Use incredibly useful widgets for displaying content on your WordPress website in an attractive way. It will catch your visitors attention thanks to: GK Comments, GK Image Show, GK News Show Pro, GK Tabs and GK Title Overlay. Vibration is a responsive premium music & event’s theme. It’s not only unique but Vibration is the first music theme to feature a page builder and loads of options to help create your perfect music or event’s website. Vibration also comes with 2 premium sliders Revolution Slider, LayerSlider and a Event’s countdown. That’s over $30’s in value. SOUNDANIMAL is complete entertainment wordpress theme. It comes with a lot of features. It can be used for any site. It is perfect for any entertainment websites..
SoundMaster Theme has been build in this way… The theme option brings you a complete tools to customize the theme at your look. Rockstar is Premium WordPress Theme, that will work either for music blog page or as your music portfolio page. If you are a musician, or you want to write a blog about the music, Rockstar is the theme just for you! Rockstar supports, one blog style, 2 gallery styles (Default Gallery and Fancybox Gallery), Pop-up banner (you will be able to add video, screenshot, text or html code in it), latest twitter news block and mp3 Music Player. With Rockstar, you will be able to choose 5 different music instruments as background image (Guitars, Keyboards, Drums, Microphone, Turntable or Random music instrument). Rockstar with newest Orange Themes Control Panel makes editing/adding/changing all settings extremely easy, that’s why Rockstar is your Nr.1 choice as Music Theme. Muse is the badass WordPress theme for all who love music, such as music bands, musicians, DJs, producers, labels or organizers of events and festivals. Theme has amazing modern and fresh design that will never get tired of you and your fans. Design you can freely adjust according to your fancy, there are millions of ways to do this. This very strong theme that offers perfect organization of all necessary data such as Events, Albums, Galleries and Videos. The theme also serves as a great blogging tool. Strings is a powerful wordpress magazine style, provided with many options. You can put a unique background in each page, blog post, portfolio item, albums, gallery you create. With more than 70 customization options you can improve your look and be unique on the web! Live! 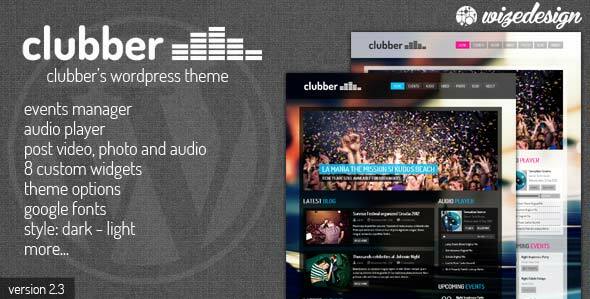 is a WordPress Theme dedicated to music lovers. Whether you are a professional or not, this theme includes all features you need for your band or label, to present, promote and sell your work online. The Rascals Labs EPROM WordPress theme is an ultimate, no compromise and ready to use WP template, suitable for widely understood music industry. Whoever you are – DJ, music producer, events producer or you just love the music – EPROM theme is exactly what you need! We’ve made an effort to give you the very best, innovative, full of options suite to fulfill all of your internet presentation needs. EPROM WP theme is an expanded version of our EPROM Html template. It’s main feature is that it’s basing on shortcodes which gives you almost unlimited possibilities of adaptation of the theme to your specific needs. In simple words: it’s very flexible. You need a portfolio only? No problem! EPROM can easily work as a stand alone, creative portfolio as well! Off-course WordPress version comes with ‘Slider Revolution’ slider, one of the best available and implemented for free so we dare to say that it’s the best deal for you!